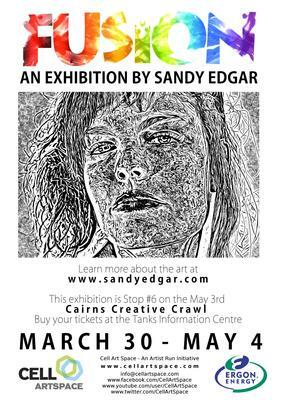 Fusion is a collection of artworks by emerging Cairns artist Sandy Edgar. The series was borne from his desire to merge his love of photography, digital art and analogue art. Working with materials such as wood, glass, plastic and referencing artists such as Andy Warhol and Roy Lichtenstein and Christian Guémy, he has produced mixed media artworks, paintings and linocut prints that will be shown at Cell Art Space during April 2013. This exhibition will also be part of the May 3rd Cairns Creative Crawl as Stop #6. Purchase your tickets from the Tanks Information Centre or see below how you can win a Free Double Pass on the bus! Cairns Creative Crawl and Cell Art Space have joined forces! Complete the Exhibition Feedback Form (link below) and you will go into the draw to win a Double Pass to the May 3rd Creative Crawl. Entries close 5pm Fri 26 April 2013. Prize valued at $30.00. Sandy, your exhibition looks set to be something a little different for Cairns. But what's analogue art? I know that my TV used to be analogue and is now digital...is that a clue?